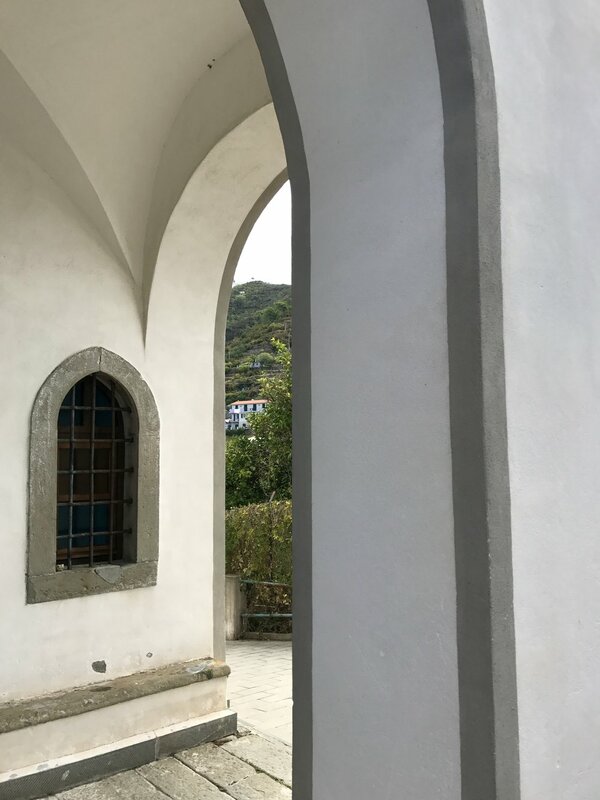 When we bought our discounted day-trip tickets to Italy's Westernmost coastline- also known as Cinque Terra- I was secretly unconvinced that it was real. I saw the pictures, read the pamphlet, pursued reviews online and stalked a fair share of Instagram models- and I still couldn't believe this place was accessible to mere mortals like me. I thought that Cinque Terra, with it's perfect, candy-coated coastline and beer-commercial beaches was reserved for beauty-blogging ex-bachelor contestants, Kardashian-level honeymoons or Pitbull music videos. And while I may have considered purchasing FitTea during a dark moment or two, I think it's fair to say I am not tan enough to fit into any of those categories. But guess what, they still let me in! No one checked how white my teeth were or asked how many Instagram followers I have. This place is real, accessible and legitimately magical. Sea for yourself. So the set up of this region is a little funky. Cinque Terra is actually made up of five small costal town; Monterosso, Vernazza, Corniglia, Manarola and Riomaggiore, all of which are accessible via the local train that looks like a toy. 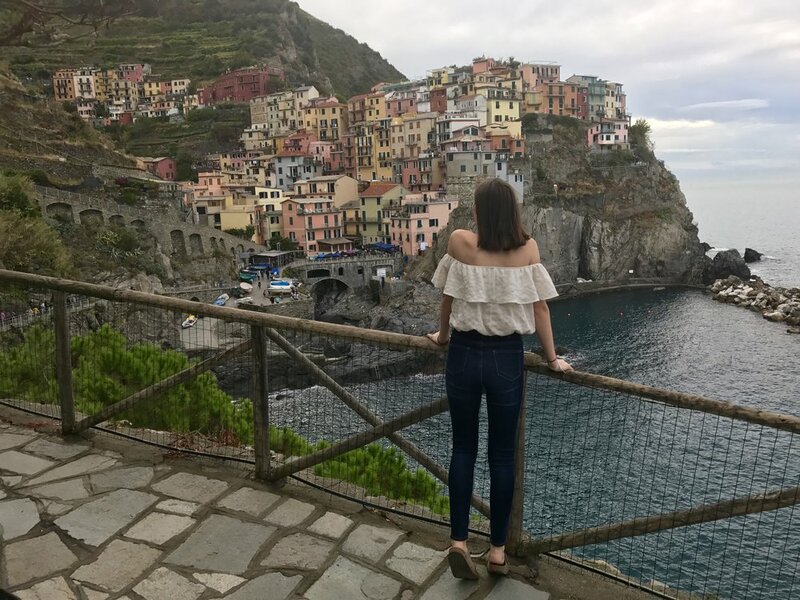 I was lucky enough to visit three of them- Manarola, Riomaggiore, Monterosso,- punctuating each pastel town with a fleeting five-minute ride almost more breathtaking than the destinations themselves. Similarly to Manarola, Riomaggiore is defined by it's cascading homes in the typical Ligurian style centered around a large, natural harbor. You could also just say the computer background of high school girls everywhere. (Mine too. No shame). We spent a little over an hour here, hiking to quite white churches, eating pesto pizza and sitting on sunny harbor-side rocks. In other words- paradise. Monterosso is the only one of the five towns with a large sandy beach intended for swimming- and it does not disappoint. Along with the (expected, at this point) cotton candy condos, Monterosso is dotted with a mix of beachgoers; old, young, tour groups and locals, all vying for a dip in the unreal waters of the Mediterranean. We found a patch of pebbly sand and hung on to it, eating our packed granola bars with gratitude in our hearts and goosebumps on our forearms. In my opinion, Cinque Terre lives up to every hype and more. It's prettier than a postcard- and definitely prettier than a Shakira music video.